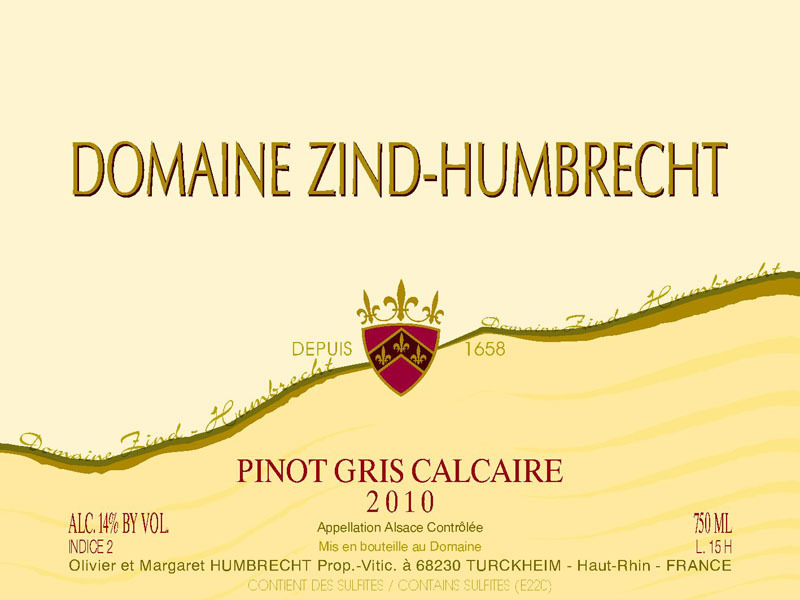 In 2010, the Pinot Gris Calcaire comes entirely from the young vines planted in the period 1988/1992 in the Clos Windsbuhl vineyard. This vineyard produces wines which are recognisable by their elegance and delicate structure, always showing a beautiful racy acidity. We tried hard in 2010 not to let these grapes go too far in the ripeness process, avoiding unnecessary alcohol or residual sweetness. This was quite easy to obtain in 2010, as the grapes stayed healthy a long time and the natural acidity was high. The fermentation was medium fast (about 3 months) and managed to ferment most sugars. There is a clear family resemblance with the Windsbuhl wine, but of course, the young vines will never achieve the level of complexity of older deeper rooted vines. 3/2012: the nose shows elegant and fresh fruity aromas (pears, citrus, white peach) but also a classic Pinot Gris expression (toast, light smoke, hazelnuts…). The limestone effect is easier to identify on the palate. This wine has a delicate texture, enhanced by a ripe acidity and quite dryish finish. Despite the more modest name, this wine will age relatively well.